Apr. 11–YOKOSUKA NAVAL BASE, Japan — The Navy will drop charges against two former USS Fitzgerald officers accused of criminal negligence in the 2017 fatal collision of the ship that killed seven sailors, according to a Navy statement Thursday. Former Fitzgerald commanding officer Cmdr. Bryce Benson and the destroyer’s former tactical action officer Lt. Natalie Combs will instead receive secretarial letters of censure from Navy Secretary Richard Spencer. The two were previously dismissed from their jobs and received nonjudicial punishment, the Navy said. Censure letters are public rebukes that draw shame and acknowledge wrongdoing, but do not carry legal implications or impact retirement benefits or pay for officers reprimanded. However, they are often career-ending in terms of promotion, particularly at higher ranks. “This decision is in the best interest of the Navy, the families of the Fitzgerald Sailors, and the procedural rights of the accused officers,” the Navy said in the statement. On June 17, 2017, the Fitzgerald collided with a commercial vessel, the Philippine-flagged ACX Crystal, in the waters off Japan’s coast about 80 nautical miles southwest of Tokyo. Seven sailors died, and the ship sustained millions of dollars in damages. It remains under repair in Pascagoula, Miss. Post-collision reports pointed to a culture of negligence, crew exhaustion and a lack of training and communication as factors in the collision. In a letter to one of the fallen sailors’ families, Navy officials wrote that “the cases are being dismissed for legal reasons that impede the continued prosecution of either officer,” according to a Thursday report by the Navy Times. In January, a military judge disqualified Navy Adm. Frank Caldwell from being the convening authority in Benson’s case because he “abdicated his neutral role in favor of a prosecutorial role” and made prejudicial statements, according to court documents. That shrank the pool of naval officers eligible to pursue charges against Benson to the Navy’s top two — the chief of naval operations and vice chief of naval operations. Legal expert and retired Navy Capt. Lawrence B. Brennan told Stars and Stripes at the time that the ruling made it “highly improbable” that the case would move forward. Benson was charged with two counts of dereliction of duty through neglect and improper hazarding a vessel through negligence. He was earlier charged also with negligent homicide, but the charge was dropped last year. Benson was accused of failing to ensure the ship’s safe navigation and “approve an adequate watch bill,” “revise standing orders to account for degraded equipment” and to “adequately train and inspect the conduct of members under his command …,” according to court documents. Combs was charged with negligent dereliction of duty resulting in death and negligent hazarding of a vessel in the collision. She was accused of failing to “communicate with the bridge vital contact information and safe speed and maneuvering recommendations, enforce watch-standing principles in the combat information center and support the officer of the deck,” according to court documents. Combs and Benson were two of four Fitzgerald officers charged with crimes in connection with the collision. Last May, former officer-of-the-deck Lt. j.g. Sarah Coppock pleaded guilty to dereliction of duty, was sentenced to forfeit half of her pay for three months and received a letter of reprimand. Last month, a Navy board of inquiry found no reason to remove Lt. Irian Woodley from the service after he was accused of failing in his duties in the collision. Woodley had faced charges of dereliction in the performance of duties through neglect resulting in death, negligent hazarding of a vessel and negligent homicide. A military court ruled there was not enough evidence to take the case to trial. Combs and Benson maintained their innocence throughout the prosecution process. 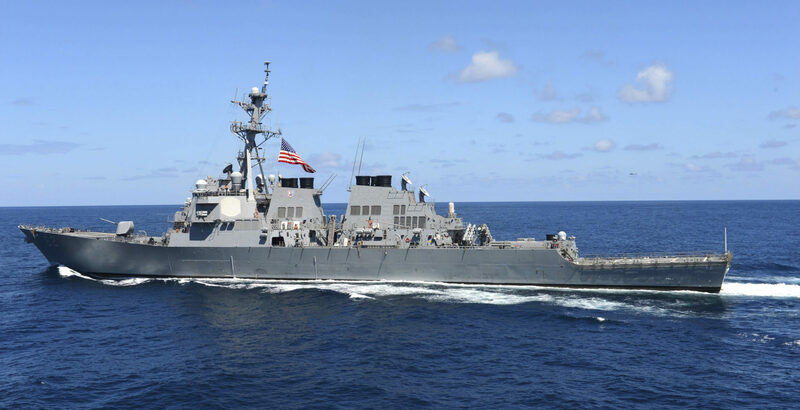 After the Fitzgerald collision and the unrelated collision of the USS John S. McCain two months later that killed 10 sailors, the Navy ordered internal and independent reviews of factors contributing to the tragedies. The reports identified 117 recommendations — later reduced to 103 — to address years of underfunded operations, an increased pace of operations and an erosion of safety standards that led to the collisions, according to the reports. In a Feb. 25 memorandum, the Navy said the service has implemented 91 of the changes. This article is written by Caitlin Doornbos from Stars and Stripes and was legally licensed via the Tribune Content Agency through the NewsCred publisher network. Please direct all licensing questions to legal@newscred.com.